The galaxy cluster MACS J1149.5+2223 taken with the NASA/ESA Hubble Space Telescope and the inset image is the galaxy MACS1149-JD1 located 13.28 billion light-years away observed with ALMA. Here, the oxygen distribution detected with ALMA is depicted in green. Credit: ALMA (ESO/NAOJ/NRAO), NASA/ESA Hubble Space Telescope, W. Zheng (JHU), M. Postman (STScI), the CLASH Team, Hashimoto et al. 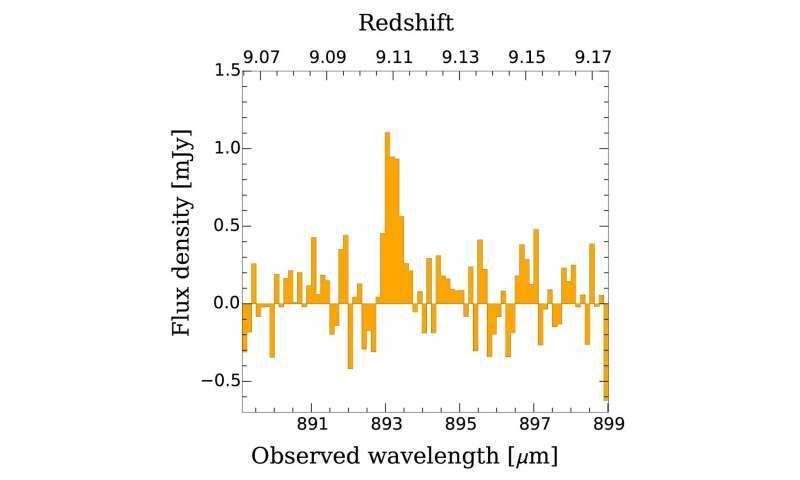 "I was thrilled to see the signal of the most distant oxygen," explains Takuya Hashimoto, the lead author of the research paper published in the journal Nature and a researcher at Osaka Sangyo University and the National Astronomical Observatory of Japan. 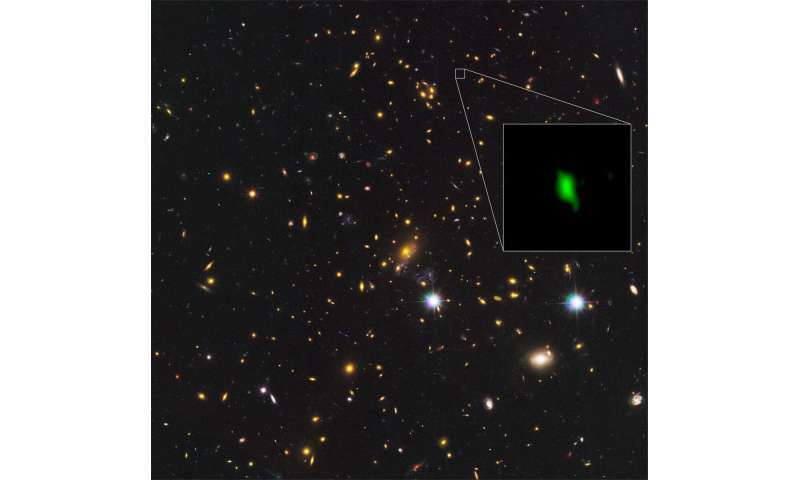 "This extremely distant, extremely young galaxy has a remarkable chemical maturity to it," said Wei Zheng, an astronomer at Johns Hopkins University in Baltimore, who led the discovery of this galaxy with the Hubble Space Telescope and estimated its distance. He also is a member of the ALMA research team. "It is truly remarkable that ALMA detected an emission line—the fingerprint of a particular element—at such a record-breaking distance." The galaxy cluster MACS J1149.5+2223 taken with the NASA/ESA Hubble Space Telescope; the inset image is the very distant galaxy MACS1149-JD1, seen as it was 13.3 billion years ago and observed with ALMA. Here, the oxygen distribution detected with ALMA is depicted in red. Credit: ALMA (ESO/NAOJ/NRAO), NASA/ESA Hubble Space Telescope, W. Zheng (JHU), M. Postman (STScI), the CLASH Team, Hashimoto et al. After they were liberated from their stellar furnaces by supernovas, these oxygen atoms made their way into interstellar space. There they became superheated and were ionized by the light and radiation from massive stars. These hot, ionized atoms then "glowed" brightly in infrared light. As this light traveled the vast cosmic distances to Earth, it became stretched by the expansion of the universe, eventually changing into the distinct millimeter-wavelength light that ALMA is specifically designed to detect and study. By measuring the precise change in the wavelength of this light—from infrared to millimeter—the team determined that this telltale signal of oxygen traveled 13.28 billion light-years to reach us, making it the most distant signature of oxygen ever detected by any telescope. This distance estimate was further confirmed by observations of neutral hydrogen in the galaxy by the European Southern Observatory's Very Large Telescope. These observations independently verify that MACS1149-JD1 is the most distant galaxy with a precise distance measurement. The team then reconstructed the star formation history in the galaxy using infrared data taken with the NASA/ESA Hubble Space Telescope and NASA's Spitzer Space Telescope. The observed brightness of the galaxy is well explained by a model where the onset of star formation was another 250 million years ago. The model indicates that the star formation became inactive after the first stars ignited. It was then revived at the epoch of the ALMA observations: 500 million years after the Big Bang. Microwave spectrum of ionized oxygen in MACS1149-JD1 detected with ALMA. Originally emitted as infrared light with a wavelength of 88 micrometers, the ALMA detection was made with an increased wavelength of 893 micrometers due to the expansion of the universe over 13.28 billion years. Credit: ALMA (ESO/NAOJ/NRAO), Hashimoto et al. "The mature stellar population in MACS1149-JD1 implies that stars were forming back to even earlier times, beyond what we can currently see with our telescopes. This has very exciting implications for finding 'cosmic dawn' when the first galaxies emerged," adds Nicolas Laporte, a researcher at University College London/Université de Toulouse and a member of the research team. "I am sure that the future combination of ALMA and the James Webb Space Telescope will play an even greater role in our exploration of the first generation of stars and galaxies," said Zheng. 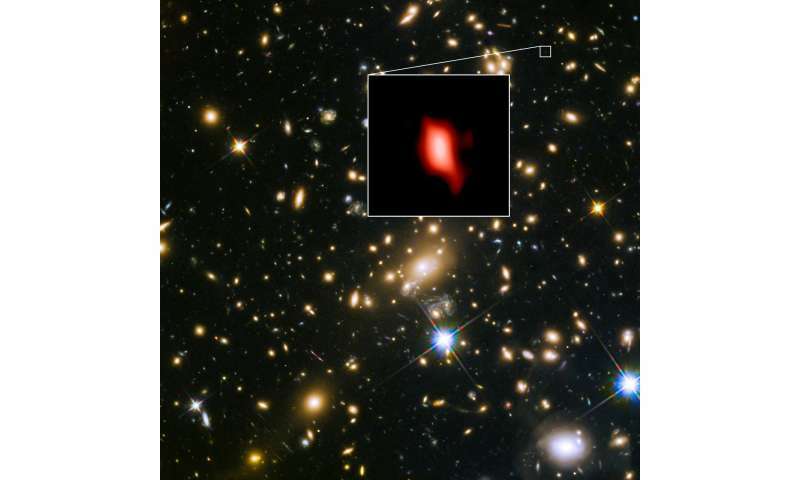 "With this discovery we managed to reach the earliest phase of cosmic star formation history," said Hashimoto. "We are eager to find oxygen in even farther parts of the universe and expand the horizon of human knowledge." This research is presented in a paper "The onset of star formation 250 million years after the Big Bang," by T. Hashimoto et al., to appear in the journal Nature. I think it would be even more interesting if they had found Iron and heavier elements, which would have entailed a much longer timeline than just the 250my after said BB. Detecting heavy elements at that distance should push back the supposed date of the supposed BB. Still, being able to detect That Much Oxygen at this distance is a pretty good feat, but that is still one data point there as to distance, now find the same in at least 3 other widely different positions in the sky. Ok i'm not all the intellectual but i understand the basics. What I'm having issues with is the speed of the galaies vs the speed of light. Wouldn't light that originated 250 million years after the big bang already have (more or less) passed us by now? Unless I'm not grasping the rate of expansion that defied all the laws of the known universe right after the big bang if we are seeing now something that happened 250 million years after everything was created, that's the equivalent of seeing something that happens in your backyard right now 10 years down the road. ^^^^^^^Rubbish. Einstein's GR predicted either an expanding or a contracting universe, not a steady state one. That is why he introduced the cosmological constant. ^^^^^Well, Einstein has been shown to be wrong about black holes, gravitational waves, expanding universe and quantum. He wasn't ignored, just wrong. As has been shown. If the earliest universe was as jam-packed with hydrogen as I'm led to believe then VY Canis Majoris stars must have formed and then blown up left and right. I'd have been more surprised if they hadn't detected metals that far back. the galaxies residing inside https://en.wikipe...ep_Field in the most distant areas of Universe look as separated and isolated each other as the galaxies all around us - no sign of accretion, universe expansion and matter evolution is apparent there. They all look as mature as the galaxies all around us. The galaxies are accretion of matter where the vacuum of space between the galaxies is occupied by single atoms of hydrogen and occasional helium atoms. How do you define "no sign of accretion"? What amazes me is how someone who "believes in" drinking their own urine is obsessed with astrophysics they are not competent to comment on. Until someone invents an 'aether' bomb? I'm sticking with craven 'parroting' of the BB/GR/SR/QM/VG sciences that result in thermonuclear bombs. What'll happen when they find stars that formed -2 million years after the "BB" ? I'm guessing we won't hear about it. Yep, all scientists sign an agreement saying that any finding that might give succour to physics cranks must be suppressed at all costs. After all, that is why they chose science as a profession. Not to discover new and exciting things, but to make sure that nothing ever changes. Sorry, man, not into astrophysics conspiracy theories. I really have trouble imagining the type of mentality that would even dream such a thing up. Next up: veterinarians are involved in a giant conspiracy to convince people their pets need to eat. Gentlemen, do you see the difference between dead and living matter? This living matter, with most scientists, tends to become dead matter. And what is alive, and what is dead matter ?. The one who does not understand it is on the verge of returning from living in dead matter. Living matter is dead matter enriched and rewarded by the Spiritual Entity, (SEU), to possess the power of consciousness, and this can not be achieved unless a spiritual spark is granted -Dusha. Examine yourself, whether you own the Soul, and what is your awareness and level. Such a stupid whisper and mockery with the SEU is evidence that these are people who have completely devastated their origins and are returning to a bunch of dead matter. The estimates for the age of the universe have shifted over the past centuries: From "inifnite" (which was still the accepted value in Einstein's day) to "25 billion years" (based on some early/crude models of how stars age) to "14 billion years" (Sanders)...with the uncertainty currently still being +/- a billion years.
" Science isn't a static "this is how it is" set of ideas "
Try throwing something unconventional or outside the prevailing mainstream theory at this forum and you will find a lot of static "this is how it is" thrown back at you. If by 'unconventional or outside the prevailing mainstream' you mean 'absurd or repeatedly debunked', I can see how you'd think that. I meant exactly what I said which is why I didn't use the terminology you did. And they were observations after reading the comments sections and commenting in them...not "thoughts". ...which is supposed to be 13.7 billions years old and about 40 - 90 billions light years in diameter. 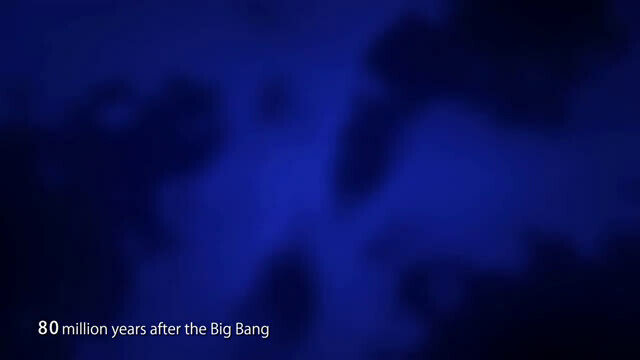 NO NO NO absolutely NO Big Bang model says/implies there is a center of the universe. You are using terribly flawed reasoning. The "diameter" you refer to is NOT the 'diameter' of the whole of the universe, which has none at least not in the 3 dimensions, but rather is only the 'diameter' of the small proportion we are able to observe due to the rest of it moving too fast away from us relative to our completely arbitrary position which is nothing special and NOT the center of anything. Are there normal people who think they can find out the size of the universe and its center. Exactly. They do seem stuck on a set of entrenched ideas and can't derive anything new. I've notice the poo starts flying if you find a flaw in their logic. Hello? Earth to mackita.........you are not explaining anything to physicists. They are not downvoting you. They are busy doing real science, and don't have time to waste on a science news comments section. They have never heard of you. You are in an echo chamber, talking to yourself. You are achieving absolutely nothing. Anybody that really did have a scientifically valid hypothesis wouldn't spend their time prattling on about it on here. Boring everyone to tears. They would publish it. It's easy to come on here and criticise scientists, because they aren't going to see it. If you actually had a pair, you'd make your criticism in the appropriate literature. Where they would have a chance to reply. Otherwise, expect to be downvoted. Why is science used only by those sizes and phenomena that can be measured by the tools that people have formed? Whether there is something subtle in nature, from which everything has arisen, even the substance from which we have formed tools for measuring. What do we, human beings, create and analyze, and want to find out many phenomena? We have at our disposal: matter, space and time. We are not the creators of any of these three elements, but we want to explain to them all the rest that was created by the combinator of these elements. Does science know what is the time, who has given a measure of time, and when time has come and from what? The same applies to space and matter. As units of these elements, which serve as measurements of their sizes, we have determined the measure of time based on the duration of rotation of our planet around our own axis (day) and reduced this proportionally to the size of the arc units of the circle. For space, we determined the length measure in all directions of space, because space is all but a point that has no dimension. But matter is a great enigma for science, related to its origin, origin and interpretation of all kinds of components, from subatomic particles to clusters of galaxies, plus everything related to the transformation of matter into energy. Nobody in the science asks how the matter originated and from which it was formed, but invented some stupid "proofs" that everything was created from nothing, and that is BB, who rolled out of the point (no dimension). How could billions of clusters be formed from this point, with billions of galaxies, which contain trillion stars, and these have many more monitors (planets and months). Whether anyone in science is interested in how human beings we have formed, and with us and before us all other living beings, and even the plant world. Is there anything for science and someone who formed matter and whether there is something from which this matter forms and how ?. All of these trembling scientific stories, which are more than ignorant on the planet, can be replaced by what is logical, natural, and what corresponds to something that is the basis of everything and that there is no need or it is normal to try to find out until the very beginning. If science seeks it, it means accepting the existence of infinite sizes. Then it is logical that the universe is a sphere of infinite diameter, filled with the substance from which matter is formed, for which the place of accommodation is determined and its movement according to natural laws, and that is space. With this space, it was determined to know the measure of this movement of matter and its positions in certain lengths of the process, and that is the time. With this all logically explained and with it all can be explained, it is only now that you need to analyze the relationship of matter with time and space, but do not imagine that they have common characteristics, they have nothing in common !! The This substance from which matter is formed and into which this matter returns cyclically, we call AETHER. Why are you so troubled and distracted by the generations that, by their ill-fated actions, return to the level of instinct, instead of raising the awareness level, which is the power to clash the true causes of the phenomenon in the universe. Gosh and I always thought it was 300 million years after the big bang. Funny that. Accounting for the presence of oxygen this early in the universe is challenging unless one accounts for it being produced by very short-lived (and therefore very massive) stars. How did such stars come to be formed in a short enough time after the BB to make enough oxygen we can see it 13+ billion light years away? Models accommodating formation of such stars so long ago are very constrained; this is an important discovery. It will challenge both galaxy dynamics and cosmological models severely. Everything what I'm saying here has been already published by someone else in the appropriate literature (and subsequently ignored). Scientists had their chance already for answer and they wasted it. I'm here for laymen, who are still paying their lives and research. I can attest to this, for I have also noticed the appropriate literature that is simply ignored. This was how I found this whole BBT to be a farce. ... These papers, and all of their data will continue to be ignored until the current observations become too overwhelming. Then, and only then will they pretend that those old papers were never ignored, and some other fancy excuse will be proposed. it must have begun forging stars even earlier: a scant 250 million years after the Big Bang. This is exceptionally early in the history of the universe and suggests that rich chemical environments evolved quickly. For a typical star takes 10million years but to accrete the mass necessary to form the stars takes 200million years. So yes 250million years is a very good ball park figure starting from the nebulas atoms to accretion to the final product "THE STAR" - WHICH COMES TO THE NONSENSE - NAMELY "THE BIG BANG". The big bang was proposed by the eminent PRIEST Georges Lemaitre as he called it in as cutely human entity the Cosmic Egg. It can bee clearly seen the time needed to accrete matter to the first star shows definitely that the stars started forming at the same instant as the cosmic egg came into being. The implication of this information can only lead to the conclusion - The big bang is nonsense! Which comes to the to the present problem eminent scientists are presently experiencing and battling with trying to get a word in edge ways amongst the deluge of scientific priests who have found a home in this new age of scientific religionism. When the scientific community entertains theoretical entities proposed by eminent priests as to the moment of creation AND THEN THEIR WAS LIGHT – The Cosmic Egg commonly called the Bigbang, I ask you, even the name the BIGBANG even has connotations of the moment of procreation. To produce, bring into being offspring – how appropriately the moment of creation is called the Bigbang. So now when all we eminent scientists are talking about the Bigbang it has a completely different sensuous silky human emotive emotion! There's a difference between throwing something unconventional at this forum and throwing stupid brainfarts at this forum. If you want to be taken seriously with unconventional ideas then at least there has to be the semblance that some thought went into them (and some work...like *real* work and not just a series of "it could be..." and "I think that's...". That's just brainfarting and will be -rightly - ridiculed as such). Some seem to have this weird idea of: "I have a brainfart - now scientists go and investigate!" When Georges Lemaitre named it the cosmic egg Georges Lemaitre was obviously acutely aware as a priest the connotation the name bigbang implied! The implications of what your implying antialias_physorg, are galaxies are the cosmic egg, they are the moment of creation. jonesdave> Yep, all scientists sign an agreement saying that any finding that might give succour to physics cranks must be suppressed at all costs. After all, that is why they chose science as a profession. Not to discover new and exciting things, but to make sure that nothing ever changes. This perceptive observation by jonesdave is very telling of your view of the world, where as jonesdave has a free open mind willing to accept new perceptions we have you describing yourself as "stupid brainfart" antialias_physorg. These syllables as you know antialias_physorg, are not my words antialias_physorg, because you know full well I do not use foul language antialias_physorg! So? What has it got to do with the fact that he was also a priest? He was an astronomer and physicists (ind, incidentally, also a priest). Nowhere in his theory about the big bang does he invoke god. He based his theory on Einstein's work of GR. He actually did *work* before publishing his theory. You know: Work. The thing that is defined by "that which you don't do"
And the reason why this doesn't work is...? You saying so? Stars are born where you find accretions of mass. The early universe had a lot of mass and was a lot smaller. Why would you *not* expect stars to form under those conditions? "A galaxy is close" is certainly not a precondition. 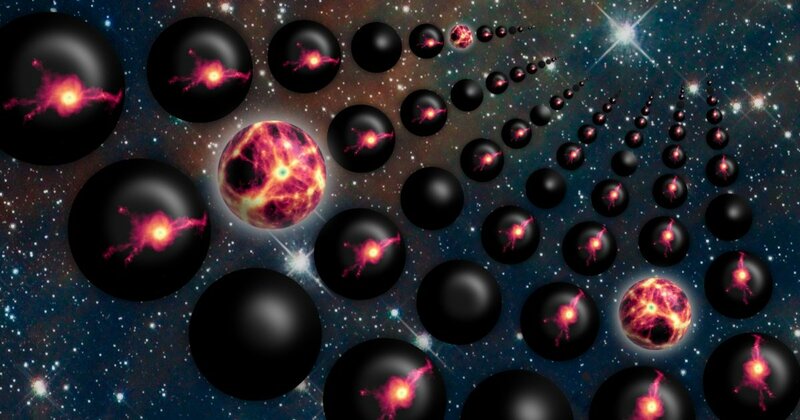 antialias_physorg> the early universe had a lot of mass and was a lot smaller. Firstly you're correct, it had a lot of mass and secondly it was not necessarily smaller because you're assuming Georges Lemaitre's cosmic egg is correct. Georges Lemaitre's cosmic egg is only trying to describe where all the mass the vacuum of space contains comes from, and in doing so he created a scenario where all the mass was created out of a small femto sized region of space. Where that mass came from to emerge from the femto sized region of space was deferred to the moment of creation Georges Lemaitre defined as the Cosmic Egg. This very point was persistently probed by eminent scientist of the day where Georges Lemaitre denied any connection with the instantaneous moment of creation and the hand of God as laid down in the scriptures. Exactly what I have just been saying, mackita. Stars are born in the accretion of mass in the arms of galaxies. "(And why this forum in the first place? This is not where science happens.)" I never implied it did, this is where people who are interested in science are supposed to be able to discuss science without the childish facebook antics we see here. "If you want to be taken seriously with unconventional ideas then at least there has to be the semblance that some thought went into them"
Do you mean like proposing a detection method for DM particles that focuses on the one property they definitely have if they exist, as opposed to repeatedly trying to detect them via a property they clearly do not have? Our conversation in that comment section was an example of you and a "static this is how it is "set of ideas decrying a logical proposal, because of the tech not existing to attempt it. Arc metal is right, there is a group of people here who act like children when a challenge to their beliefs is presented, and those who act like children when something supports theirs. "These armchair-generals are seriously deluded about how science works (and also about their own IQ compared to the rest of the species.. Just because you can type scientific sounding words does *not* make you smart or a scientist)"
The armchair generals here come in all flavors, not just the ones you think of when you use the term. I had a debate with one of them about an article that theorized a certain physical phenomenon occurred that resulted in our observation. I said I doubted the theory, stated why, then had a multi-post debate where the armchair general ended up saying exactly what I said in my first post (the one he was debating) as his final point. Since then I refrain from commenting as much as I would in a different environment. However, that said I did respond to your post here as I did because of the exchange we had previously which I referenced in my post above. But at least I did it politely. And as we speak antialias_physorg more Obfuscation! This time in galaxies maturing, I knew the day would arrive when galaxies would be observed older than the background radiation! The solution is simple, just as we defer the creation of mass to the cosmic egg we describe galaxies older than the background radiation as early maturing galaxies. The probabilities of all these universe's coming into existence at the same moment is more than enough to shake any believe in the ever after! Exactly theredpill, Nobel Prize winners, professors and an extremely diverse selection make up the community that frequents phys.org and we do not want it any other way! A large proportion of science was and is undertaken by ordained priests, genetic variation in peas is example. This is because science and the ability to write is necessary, where priests and monks had to be able to read Latin and part of their vocation was studying nature and helping cure the villagers ailments. Consequently monks had to be scientifically minded as it when with the discipline in learning and reading Latin. "A large proportion of science was and is undertaken by ordained priests,"
This is one of the historical facts that I have always wished I had more time to research. Science was fathered by people of religion, along with artists and artisans...anyone who transformed natural elements into something useful or just nice to look at. Today, and especially here, there is a mindset that one cannot have spiritual beliefs and still think scientifically...a false divergence created in the minds of those who believe one cannot accompany the other. Granted, a lot of religious people haven't done anything to help the situation...but putting a spiritual scientist into the same category as a TV evangelist because of a belief in God is the same as putting someone who believes in as yet unproven theoretical postulates in the same category as someone who believes in Santa Clause. mackita> Mainstream physics has no monopoly to information about latest findings. What I do not get is antialias_physorg out of charachter out burst that consequently backfired. Dr Jarosław Duda often used to go on physics-world commentaries for a brain storming session and it was really difficult because he is an assistant professor, so I just cannot understand antialias_physorg's outburst and extremely bad language. Dr Jarosław Duda is extremely polite well spoken and never utters even the slightest bad language. Obviously there is a class above Cambridge graduates at Jagiellonian University! ***This perceptive observation by jonesdave*** is very telling of your view of the world, where as jonesdave has a free open mind willing to accept new perceptions we have you describing yourself as "stupid brainfart" antialias_physorg. Nope, it was irony. Scientists do not do science to cover things up. On the contrary, they want to find new things, to have an exciting area of research. If their discoveries mean a previous assumption has to be fine tuned or even overthrown, then that is what happens. What they don't do is take the time to read places like this, scanning every bit of idiotic woo known to man. You will get the odd one on a proper physics forum. I suggest the wooists look for one of those if they want feedback on their woo. We all know that won't happen though. I know it was irony, sometimes you're supposed to let the prevalent view prevail if that is what everyone thinks you said and just take the credit for some you didn't really say, sort of taking credit by staying silent on the matter. Because deep down jonesdave, its true. I've just done it again haven't I. Why not even one of these observations was attempted to replicate, for example? I typed 'room temperature superconductivity' into Google Scholar. There is tonnes of stuff. I'm not checking it all. You do it. "They" never checked it because you have to publish it in a journal of scientific record, not on a KGB hacker site. Thank you. This isn't the first "science" forum in which I have noticed this effect. What seems to set them off the most is when you point out a flaw in their logic... soon after they don't seem to know how to answer and then simply resort to throwing poo, and suggest that I have broken some forum rule and that I need to leave. This effect also exists in the labs around the country, but its more subtle. The reason being, in the work place where people have to meet face to face they tend to be more polite. So instead, the new ideas are ignored or at best put off for some future exploration which never happens. Their focus is to stick with what is laid out in their grants, anything radically new that's discovered is ignored since its an outlier. Real simple: compare what you say with what gets said in the scientific paper you're talking about. If they're talking math and providing data and you're not, you're probably a crank. If someone points out a reasonable objection to your speculation, don't respond with rhetorical conundrums; if you do, you're probably a crank and you're definitely a troll. These papers, and all of their data will continue to be ignored until the current observations become too overwhelming. Then, and only then will they pretend that those old papers were never ignored, and some other fancy excuse will be proposed. "For all those people who find it more convenient to bother you with their question rather than search it for themselves." granville583762> ***This perceptive observation by jonesdave*** is very telling of your view of the world, where as jonesdave has a free open mind willing to accept new perceptions we have you describing yourself as "stupid brainfart" antialias_physorg. jonesdave> Nope, it was irony. Scientists do not do science to cover things up..
jonesdave:- its called critical mass, when sufficient people come to realise there are galaxies older than the background radiation, they stop believing the Obfuscation that it is early maturing galaxies. You know this yourself, because no one can hold a candle to you when it comes to obfuscation, you've turned it into an Art Form. I must be losing my grip, there's too many complements coming your way. No expletives on this site, call it the Cosmic egg much more civilised or better still the Background Radiation as this has no connotations. When the Background Radiation has a date of 13billion years, it is difficult to date to millions of years because the telescopes are at their limits. But one thing is certain there are no such entities as early maturing galaxies because it does not make any difference where in time and space a galaxy oringinates in the vacuum of space. A vacuum has no preference, there is no such thing as an early maturing galaxy – it is the epitome of Obfuscation. The Background Radiation is not the begging of time! As you have to prove a point, and a galaxy 13billion light years is difficult to prove either way especially if you have not got access to one of the billion $$$$ telescopes and not even then. If you want to prove the background radiation as the begging of time, just hone your theories and explanations and collect your Nobel Prize! Today's science, in attempting to find out many unknown phenomena in the universe, behaves like a cat that circulates in a circle trying to catch its tail !! And you are in this vortex, because the unknown structure of the universe. what do you think is the Creator of these phenomena, which you are futile in a futile way, so naive and incapable, that he has made so much a mess in nature that you see in a hundred ways, but neither one agrees with either nature or common sense. ? Explain that your dense ether model. If it is so thick, can anything be diluted? First born galaxy center supermassive concentrations which expanding and recycling expanding dark matter with each other. When two expanding supermassive concentration collide together, born new expanding galaxy inside to outside. There is no pulling force or curving space. Just expanding nucleus of atoms which recycling expanding pushing force which have a nature of expanding light and nature of expanding electrons. How is it possible, you still don't know about it? So glad to see you posting again, hadn't for a while was a little worried, mon ami.